John Knowles' beloved classic has been a bestseller for more than 30 years and is one of the most moving and accurate novels about the trials and confusions of adolescence ever written. 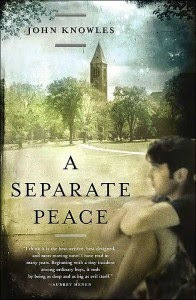 Set at an elite boarding school for boys during World War II, A Separate Peace is the story of friendship and treachery, and how a tragic accident involving two young men forever tarnishes their innocence. This character story describes the coming of age of young boys attending a prep school during World War II. Gene cares about his grades and is the academic, and Finny is the star athlete. The two are friends and roommates. Finny can't seem to do anything wrong. He starts secret societies, breaks rules, makes up games, and essentially tells everyone what they should do. Gene on the other hand wants to study and follow the rules, but can't seem to tell Finny no. Eventually disaster strikes and changes the lives of both Finny and Gene. This is a very popular and well-written story and many describe it as a classic. The characters are well-drawn and shine throughout the novel. The story is set during WWII but the storyline isn't tied strongly to this. I shouldn't have been shocked by the end (I should have read this book long ago) but I was taken by surprise. The only real problem is that I didn't care about the story. I like coming of age stories but this one just didn't do it for me. The characters were well-written but I didn't feel inclined to root for either Gene or Finny. What did you think about this book? Did you read it in high school? Are you secretly judging me for just recently reading it for the first time (don't worry, you can tell me)?